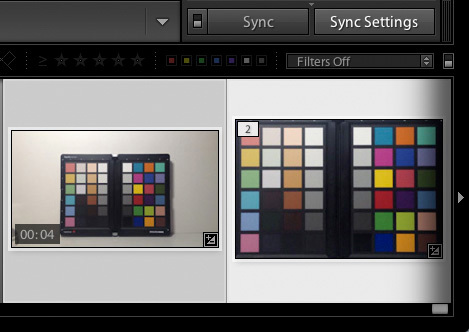 Datacolor’s SpyderCheckr produces color correction presets for Lightroom, ACR, and Phocus. These presets are typically applied to still images processed in these applications. Now that Lightroom 4 can catalog, clip, and even make basic adjustments to your video, the question of using SpyderCheckr Lightroom Presets to correct color for your video cameras arises. This possibility is particularly interesting when it comes to adjusting video capture from different types of cameras, such as GoPro cameras and DSLRs, or different types of DSLRs, to match their color as closely as possible. The answer is: yes, it is possible to apply an existing SpyderCheckr preset, from a still image shot with your camera, to video shot with the same camera. However, since that preset was most likely shot in RAW, and certainly as a still image, its best to start from scratch, and shoot the SpyderCheckr target in a video clip, to capture the actual video workflow for color correction. You can then capture a still frame from the video, and process that still frame the same way you would any SpyderCheckr target shot. 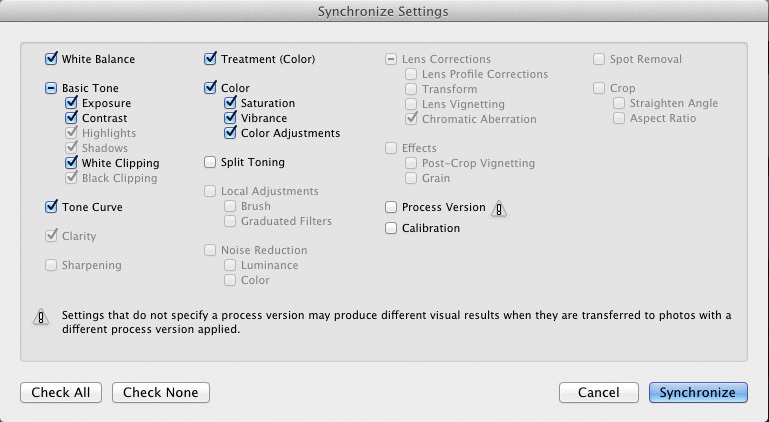 The resulting Preset can then be applied to a still image, and by selecting that still image and one or more video clips, the Sync Settings button can then be used to apply the color corrections to video clips. The dialog box shown below will appear, showing which of the Lightroom Development Settings can be applied to video. Be sure the Color Adjustments box is checked, so that the HSL Adjustments from SpyderCheckr will be applied to the video clips. Once the clips have been color corrected for the camera they have been shot with, they can be exported from Lightroom for processing in any other Video Editing application you use. Be sure to check the Include Video Files checkbox. Versions of Lightroom 4, up to 4.4 appear to have a bug when Video Export is set to Original in Lightroom 4. If your video clips appear to render instantly, without taking the necessary time to apply the corrections to each frame, it may be necessary to choose another Export format in order to have your Lightroom Cuts and Adjustments (including your Color Correction) applied to your video clips. It may also be possible to force the edits to render, even in Original format, if you first flag the video clips. However, the flag icons are conditional in Lightroom 4 Library mode, and disappear when a video is the selected item. So instead, set the Painter tool to Flag, and “spray” the videos you wish to flag, so that a flag icon appears in the upper right of each in grid and filmstrip mode. These flagged videos should (this may be a conditional bug, so no guarantees) render with edits in the Original format. A future article will focus on the process of tuning output from different cameras for use in the same video project. David Cardinal recently wrote an article on my presentation at Stanford University for the Datacolor SpyderBLOG. 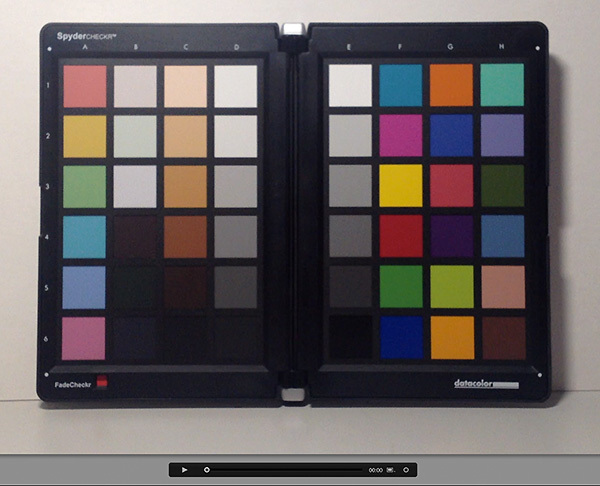 For those of you interested in color management, it covers some of the issues I addressed in that lecture. This webinar will be a discussion of the strengths and weaknesses of phone cameras, and ways to utilize them effectively, including add-on lenses and editing applications. This webinar is sponsored by Datacolor . David Saffir and I will be discussing a range of sample images, chosen for their value in illustrating phone photography methods and techniques. Please join us for what we hope will be an interesting discussion on this hot topic. And stay tuned, as there will be a photography product given away to one attendee at the end of the session. Sign up now, we’re hoping to see you at today’s webinar. 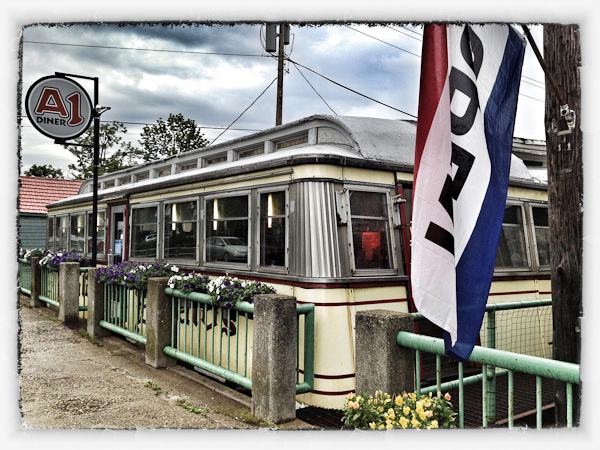 Last year’s release of Photoshop Touch for the iPad brought iOS image editing to a new level. However, the camera in recent iPhone models are superior to those in the iPad, and iPhones are the tools most commonly in-hand for photography. So, lacking a phone version of Photoshop Touch meant being marginalized as a mobile editing tool. Now Adobe has remedied that situation with new releases of PS Touch specifically for the iPhone and Android. The iPhone version of the app clearly uses the same engine and tools as the iPad version, with new palettes and organization to fit the reduced format of the iPhone screen. 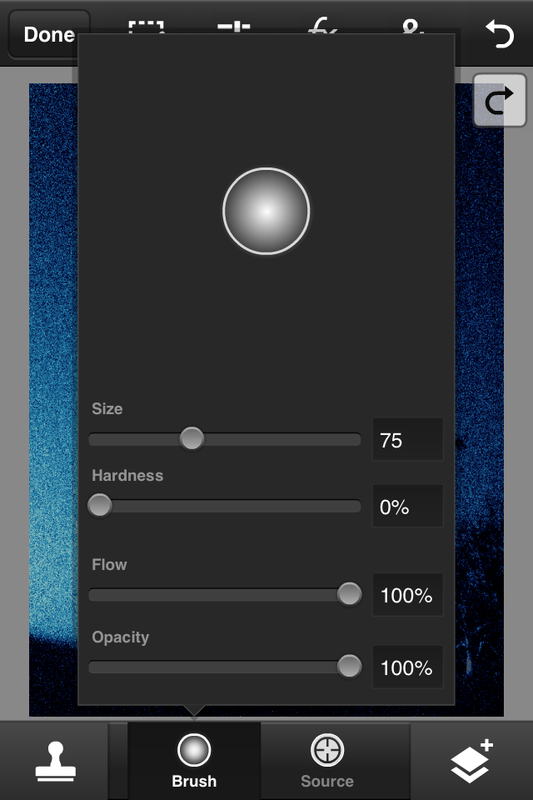 This provides a level of control, including powerhouse features such as selections, layers, and warp controls, that have not been available in most iPhone editing tools to-date. But are these tools what users need for the types of editing most likely to be done on a phone? Yes, and no. Yes, there are certainly times when nothing but powerful tools and localized edits will do the job. But no, these are not the features most often used for phone photo editing. Phone editing, for the advanced user, has always been a game of hop-scotch, moving from app to app for special features or unique filters. Adding Photoshop Touch to the mix simply adds new, and often familiar, tools to the toolbox, without replacing the apps already used for other types of work. 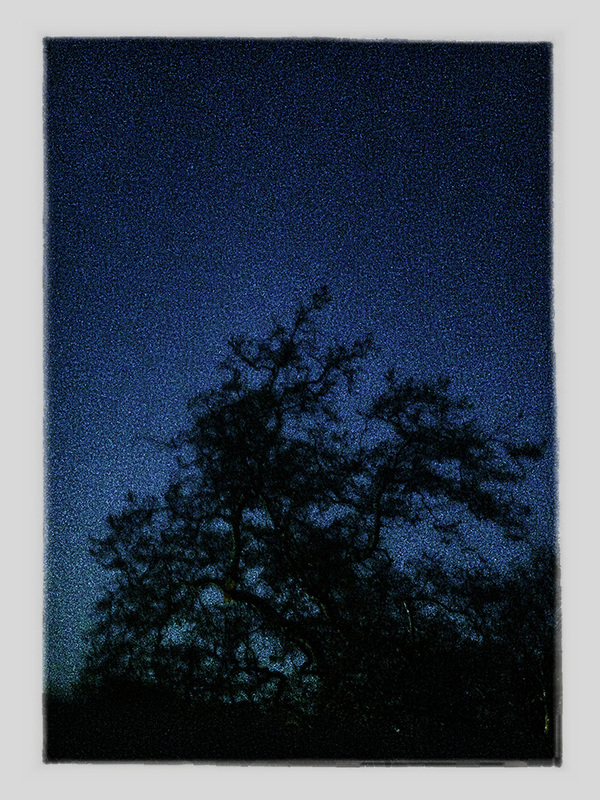 The image below is a night shot of a tree against a dark sky; difficult territory for the iPhone, with its small sensor, and weak low light capabilities. 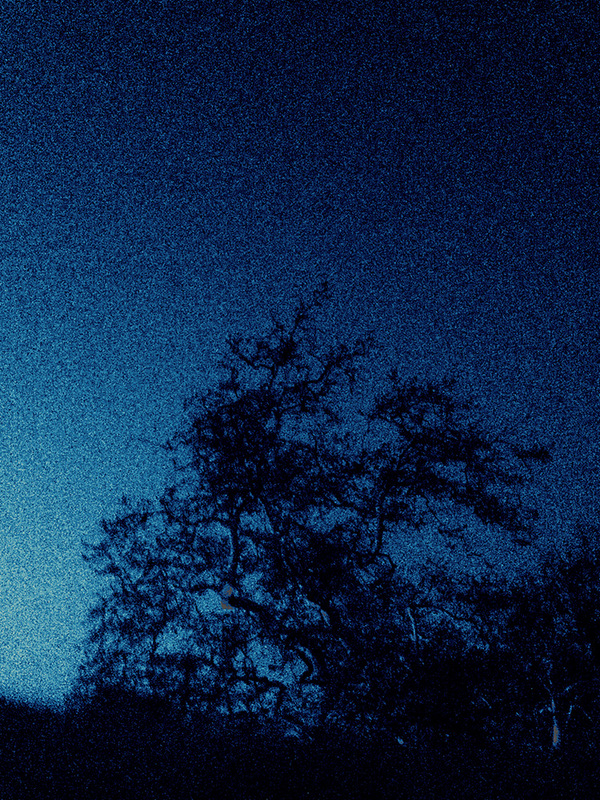 Here the noise in the sky has been used as a feature instead of a flaw, by enhancing it though a series of edits in NIK Software’s Snapseed app, a leading iPhone and Android image editor. Below is a version edited with the same intent in PS Touch. Touch allowed some amazing capabilities, including inverting the image for some adjustments, then reinverting afterwards. However, while the image retained more detail, the process was slower and more complex, and the artistic intent was not quite as well served. The lack of border effects in PS Touch also meant that the image would need to be saved and opened in another app, such as Snapseed, for bordering, if that was a desired effect. Overall PS Touch is a welcome, and affordable, addition to the phone editing toolbox; if not a complete toolbox unto itself. 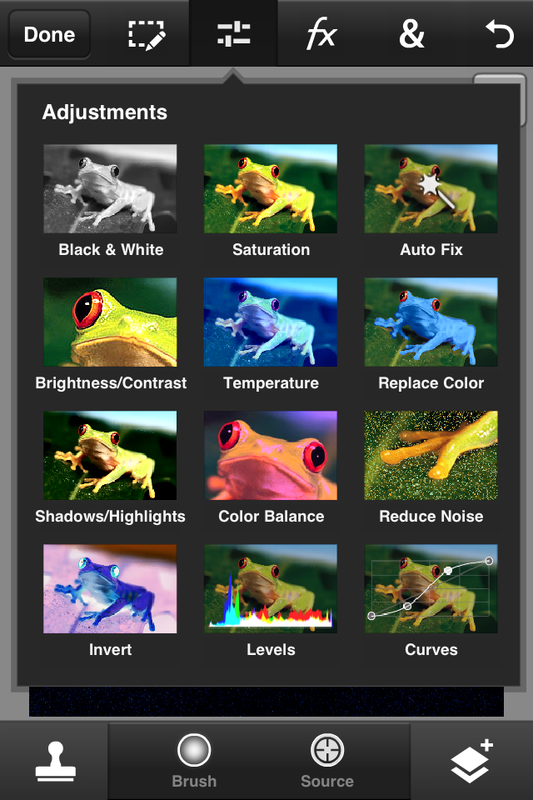 With any iOS image editing, remember to check the image in Datacolor’s color managed SpyderGallery app before publishing, to be sure the color is as you intended it to be.